The best way to find wedding gifts for dog lovers can be found right here. There are many cute items that are dog themed or related and the possibilities are endless. Gifts that are adorable, functional gifts and home decor, all with sweet pooches in mind. Whether the newlyweds have a dog or maybe have future plans to have a dog, these lovely dog themed gifts will be welcome in their home. If they love dogs, this super selection will have them delighted. 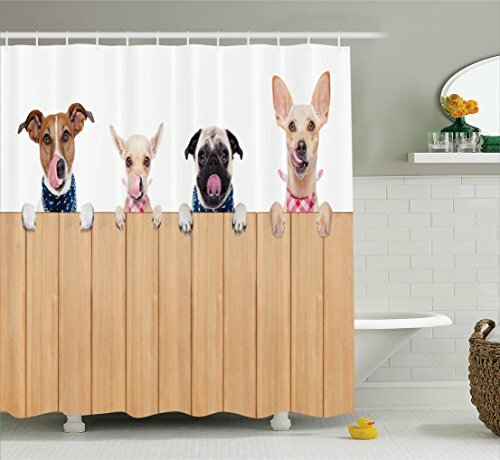 Here’s the number one shower curtain for all of the newlywed dog lovers. These sweet canines are all lined up at the fence for lunch and looking cute as can be. The bride and groom will love the spark of attitude this shower curtain brings to the bathroom. And in their favorite theme. 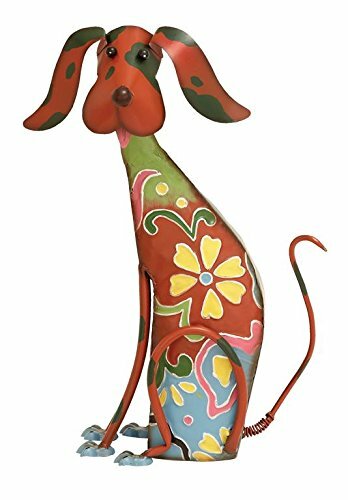 Brightly colored and ready to put a smile on everyone’s face says it all about this beautiful metal dog sculpture. If you are looking for unusual gifts for dog lovers, this one is a keeper. A very cool sculpture with nice detailing that can be used indoors or out. Such a plus for the newlyweds to have decor that can be displayed just about anywhere. That tail will be wagging whether sitting in a sunny yard, porch or inside by the window. Wherever this whimsical pooch lands, the happy smiles will abound. When I married years ago, well not that long ago (hehe), I had never thought about buying coasters and neither did we receive any as a wedding present. And thinking about the young age time we were in, we probably did not need any protection for our hand me down tables anyway. Soon, thereafter in a year or so the reality hit home when buying new tables…. So on to this year when everyone has at least one new table and at least one dog, coasters are now a much needed necessity. Have fun checking out the best dog coasters collection. Each set is cuter than the next! Cozy and soft with two precious dogs make this quality fleece throw the perfect gift for a dog lover. 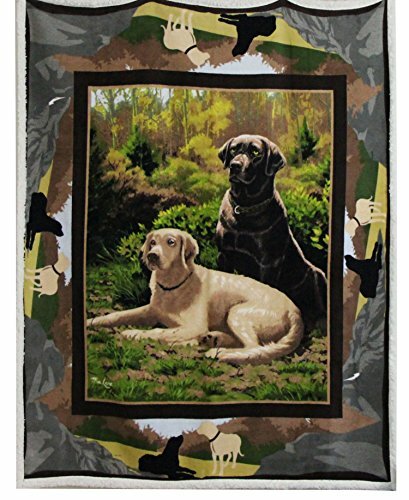 Not only is this a cuddly, warm blanket, but the beautiful Labrador print is one that will warm the hearts of the bride and groom. Everyone can use an extra blanket in their home (I know I can) and the colorful print and nice details make this one extra special. There are so many handy uses that the newlyweds will find for this fleece throw. A great blanket to keep in the car for picnics, football games, bonfires or travel. At home, a sofa throw, bedroom blanket or guest blanket would all be a perfect fit. Surprise the bride and groom with this adorable doggies coat hook. They will love that it is made of cast iron and durable enough to hold coats and bags. Pair this dogs hook with some cute dog hanging ornaments and you may have come up with a unique and outstanding gift. Do the bride and groom have a dog? 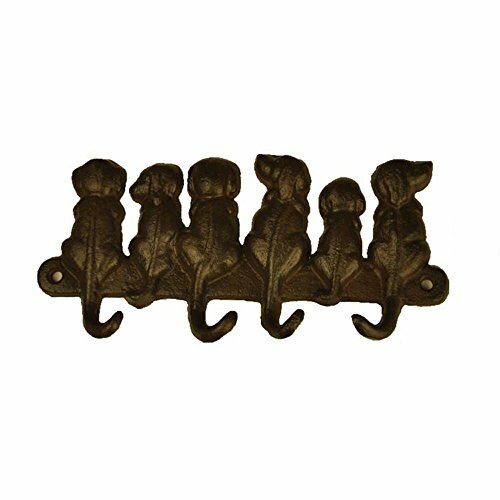 This doggie coat hook will make a nice collar/leash holder. Monopoly has seen it’s day and the dogs are taking over. 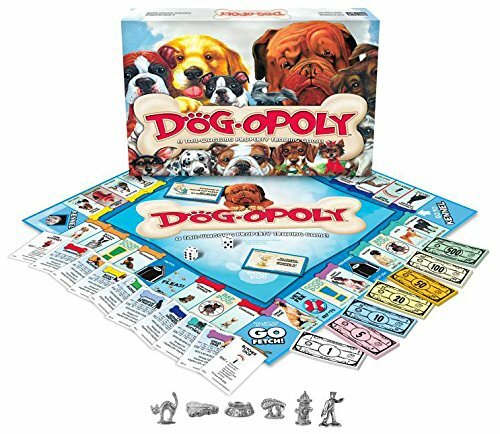 Here comes Dog-Opoly, a fun filled game of dogs that is based on the original Monopoly. Instead of properties and utilities, enjoy dealing with breeds and dog houses. A fun game for the newlyweds to entertain with other couples and have a game night. Maybe have a dog night too if everyone brings their dogs. Doesn’t that sound like fun wedding gifts for dog lovers?! Looking for unusual wedding gifts for dog lovers? 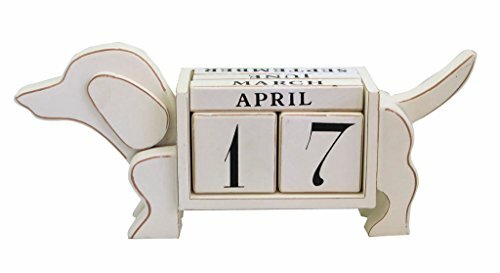 A shabby chic doggie perpetual calendar will keep track of time and also be a beautiful addition to any home. The newlyweds will love how this calendar fits right in with their doggie decor and shows their love for animals. Choose this gift for a bride and groom that loves dogs and has a busy lifestyle. The perpetual calendar shows no years, only months and days which makes it a truly timeless gift. One of the wedding gifts for dog lovers to last a lifetime. Love the wagging tail sculpture but favorite is the doggy coat hook, maybe because we’ve already got some … LOL. Fun idea to make gifts about their love of dogs vs traditional house gifts.